It started a few months ago with my oldest daughter electing to eat a salad over having pizza. While I was a little surprised, I wasn't shocked, the pizza didn't look entirely appetizing with greasy pepperoni and cheese as it's only garnishes. Not to mention that she LOVES salad and will often request it as her main dinner choice. A few weeks later, and ironically the same day as our endo appointment, my youngest daughter confided that she didn't take the morning birthday treat - a gooey chocolate cupcake. She explained that it didn't really look good and besides, she didn't want to have to pee in a cup from a high blood sugar. Listening to her story in the endo waiting room, my husband and I locked eyes but thought that maybe it was a wise decision and didn't say much more. I wouldn't want to pee in a cup either! And after those two big moments, there have been many more... from selectively choosing treats and desserts, to skipping a taste-test or actively refusing snacks in favor of eating more at dinner. Which is all very interesting in a house that has fully been accepting of 'kids first, diabetes second'. This limiting of sugary snacks, fatty foods or carb filled avoidance has been entirely of their own choosing. We have always made a concerted effort to avoid tug o' war over what is good vs. what is bad. Instead, we opted for the route of letting kids try new things and to see if they even liked it... mostly just hoping to give them the gift of culinary enthusiasm. Without type 1 diabetes, I might not have even noticed it... but with, well as a parent who carefully watches to ensure carbs are correctly calculated AND bolused, I can't help but see what is happening. I am not alarmed or worried. But I am pleasantly surprised (and a little inspired). Eating well and choosing food selectively is never a bad thing. In January, a tree fell on our house. At the time, it didn't occur to me that having a tree fall on your house was eerily similar to having a diagnosis of type 1 diabetes land on your child. I did exactly what I did the for both of my daughters' diagnosis, without thinking too much, rolled up my sleeves and learned all I could about trees-on-top-of-houses. I did that by rallying everyone that I knew and getting the names of the best tree-on-top-of-houses experts. Then I begged them to help. THAT UNLIKE REMOVING TREES, I CAN'T REMOVE TYPE 1 DIABETES. Not even by knowing all of the foremost diabetes-landed-on-my-child experts. So, I sit here and as I type this 'ah-ha' moment out, I also sigh a little bit louder, feeling extra sorry for my kids and for a moment, feeling extra sorry for myself too. It's not my happiest 'ah-ha' thought and part of me feels ashamed for unloading all of the sadness onto you, because this is supposed to be an optimistic kind of type 1 diabetes blog. The kind of blog that gives hope out daily. Maybe that is it (another ah-ha moment)... maybe the point is that I CAN'T REMOVE TYPE 1 DIABETES... but maybe the point is to focus on ALL OF THE EXPERTS THAT CAN. Maybe my lesson from this is to remember that the job of fostering HOPE is a big one. If we forget hope, we might forget to advocate. And things like trees would still be stuck to my roof. Or glimpsing the future, things like type 1 diabetes will never get the attention that it needs to become a moment of the past. Certainly, all of those experts need us to continue to speak up and ask for their help - because one day, they WILL BRING US A CURE. For that, I will continue to have HOPE. Yes! You guessed it! The Florida sun, baby!!! We are heading to see that big, handsome mouse at Walt Disney World!!! Read here for more on Walt Disney World and Diabetes. Remember when I told you about a recent Expo on World Diabetes Day where we had the pleasure of speaking to our favorite pump reps? Well, at that little conference, the girls were gifted some swag in the form of a laptop looking case from Animas. The case is really neat and has a short handle and a long comfy strap for over the shoulder hands free ease. There is also a large pocket on the exterior that is perfect for easy access to important medical paperwork and contact information. Bonus is that this case is only about two inches wide and super light weight. So much nicer for our trip and truly a space saver. It also came lined with a removable foam insert that would most likely fit a nice sample selection of pump accessories. Which is great if you are out there selling Animas Ping insulin pumps. Since my girls are not in that business (although, we could be at this point), I put my thinking cap on and carved out a little bit of the foam and made a custom area for all of the things that we would need on our vacation. Isn't this gorgeous? And who knew that seeing our pump supplies so neatly arranged would make my heart pitter-patter like this??? I hope I am not the only one. On one side of the case, I placed our basic pump and blood sugar meter supplies. On the other side, I added things like extra batteries for the meters and for our Animas pumps. I also included an array of wipes like Unisolve, IV Prep and Alcohol Swabs. Since anything can and does usually happen on vacation, I made sure to add EMLA cream for numbing (sunburn and infusion sets are not fun for anyone), neosporin and even a little fast acting sugar in the form of Smarties (USA brand). Notice that package of BD Ultra-Fine syringes? Emergency back up for anything that might happen. Scissors, Cortaid, nail clippers, vaseline and a thermometer top off the set. Things that you don't see like Apidra and Lantus will be added at the last minute to a waterproof container that will fit neatly into our cooler. We will also add our youngest daughter's Levothyroxin and make sure to bring a few kid-friendly chewable ibuprofin tablets as one last safety measure. While I don't mind buying things on vacation, I find that it helps all of us if mom can magically produce whatever we need right there in the hotel room. Ah, the magic of mom - I mean, er, Disney! After I wrote a blog article on how my daughters love to add a flavor to their plain, bottled water at school, one of my local friends and fellow t1d mom, Angela, recently reminded me of a fantastic water beverage that hit the market a short time ago. The product is called Twisted Water and the dad, Peter Andoni that created the idea, did so on behalf of his young son who lives with type 1 diabetes. My son, Alex, was diagnosed with Type 1 Diabetes when he was seven years old. I made a commitment to Alex and to all of the 1 in 3 Americans born today that will have a form of diabetes to provide healthier beverage options. This story gives me such warm fuzzies. Not only do I love parents who are out there making a difference for their children, but I also love the idea that this father is going a step further in helping all of the other parents and children who are living with type 1 diabetes. Yes, on behalf of his son, this father is also donating a portion of all Twisted Water proceeds straight back to JDRF to help with furthering research, technology and even a CURE! Designed in a cool, sports-top plastic bottle, Twisted Water is full of vitamins B,C, D, is low in calories and has just 11 carbohydrates per serving. It contains no caffeine, high fructose corn syrup or artificial flavors and colorings. A few days ago, my friend Angela and I met up and she graciously provided me with a case of Twisted Water in the flavor of Berry Fusion. No sooner than I walked into the door, both of my daughters were instantly clamoring for a sample of their own. Now if there was ever a real taste-test panel, than this is it! Two girls ages 9 and 11, who won't hold back on their thoughts of what Twisted Water tastes like. Both held the bottles, carefully inspecting for the coolness factor before even opening them. And the verdict? They LOVED it! While they both agreed that Berry Fusion tastes great, they also like the sports cap top. The colorful bottle caught their eye and they liked the way it felt in their hands. Easy to open and with a good grip. Both said they were way cool and also excitedly asked if they could have them packed into their lunches for the following the day. I personally liked the idea that the water still looks like water and doesn't have a bright color from artificial dyes. After tasting it, both girls wanted to know if it was a drink that could leave the kitchen (because anything staining can not - we have a white couch. I know, CRAZY, right?!) but I felt that Twisted Water would be fine. The only downside for me is to make sure that the girls remember to bolus for those 11 carbohydrates. We solved that by setting a rule that if they were to drink one, they had to test their blood glucose, dose insulin and then only after that was done, drink. So far, so good and no "oopsies" have been reported. One last point is that Twisted Water is a Michigan-made product and company. If you have read any of the national news or if you live in the area, you know how our economy is struggling. Anytime that I can help a local company, I try to... and then, if I can help a company that supplies products made in America, I also try to do that too. Maybe just one more great reason of why you want to give Twisted Water a try! You can order it here on Amazon.com or if you are local in Michigan, here is a list of stores. And if you do, please leave a comment either on here or on our Naturally Sweet Sisters Facebook Page to tell us what you thought of Twisted Water. Just wanted to say that I was provided a free case of Twisted Water but I was not asked to endorse the product. After I sampled it, I thought that it was great and wanted to share my own opinions and thoughts about Twisted Water. And secretly, if those good people at Twisted Water would like to share some more, I am sure that I would have two happy girls ready to help drink it:) Yes, it is THAT good! Thank you Twisted Water! 6th Graders and Wii - Slumber Parties are so techy these day! I have written before of how we manage slumber parties. Using a four point plan that includes constant texting, planned meal times, wake-up times, and scheduled blood glucose checks, I feel as though we have been fairly successful with any and all sleepover events. I don’t think I have ever written of how hosting a slumber party can be managed. After having our daughters away overnight at several of the last few sleepover opportunities, I felt it was my time to be the hosting parent and offer all of the kids (you’re welcome parents!!) our home to hang-out. Besides that, as my oldest daughter is growing up, her needs for independence are gaining speed and I wanted to have an inside look at some of the new friendships she had been making in sixth grade. What better way than to have a party at our house? We took a quick peek at the calendar and landed on Valentine’s Day weekend (you’re welcome parents – again!). My oldest daughter thought of several friends that she wanted to have over and since one had a younger sibling, my youngest daughter was thrilled to have a “friend” for herself as well. Before the party could start, there was cleaning and activity planning to be done. The kids also wanted some treats, so we carefully counted carbs for homemade cupcakes and mini pretzel rods dipped into chocolate. About ten minutes before the first guest arrived, I asked the girls to take a moment and to check their blood glucose levels – mostly to be sure that no one would be low and to also have the task completed before dinner started. 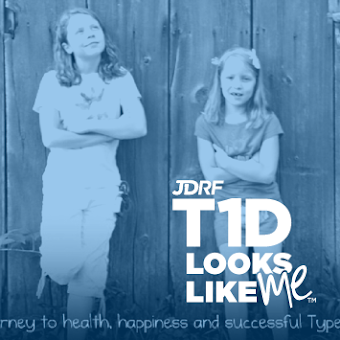 My thought is always to fit type 1 diabetes into their lives and not the other way around. This game is called Mucho Nacho and is a variation on eye-spy! It worked for one daughter who had beautiful blood sugar numbers from the start and for the other, a sudden drop in blood glucose happened right after the first few guests entered. After a quick chocolate milk and a few glucose tabs, she was back in the swing of the party quickly. After the rest of the guests arrived, my husband completed his one assigned task (Dads have it so easy!) of taking orders for take-out pizza and delivering it directly to the girls in their party den. Relieved to know that was all that was needed of him in a house full of girls, he quickly headed off to another (quieter) part of the house to watch his college basketball game. The girls finished dinner and started a party Wii game and were soon filling the entire house with giggles, screams and laughter. Even my husband watching basketball was chuckling with them. Nothing sounds better than laughter filling the house! However, at this exact moment of joy, I am reminded of the needs that my daughters’ have in order to keep enjoying themselves. It seems to always hit like that, just when you relax, you remember…. But asking the girls if they did that can send them into a tailspin while they are trying having fun. Asking is akin to nagging them to stop what they are doing and to perform what they see as a “chore” in the middle of their game. So to thwart that negative feeling ahead of time, the girls and I developed a little hand signal. I don’t even say anything, just gesture using my hands to create a square (like an insulin pump). With that one small move, the girls know exactly what I am asking for and either bob their heads up and down to confirm they did it or give me a surprised “I forgot!” look and enter their carbs. For the party, neither one remembered so both gave me surprised looks but instantly whipped out their insulin pumps and bolused. I breathed a sigh of relief in knowing that all was well – at least for the moment. The party continued on and girls checked bgs as the need arose (another nice caveat of hosting is the availability of all of their testing supplies right out in the open) and bolused for things like cupcakes, pretzels and then later, even popcorn before bed. Right as the party was starting to wind down, the girls decided the basement was too scary to sleep in and made a mad dash for our oldest daughter’s bedroom. With 8 sleeping bags crammed around the room, I decided to give the girls notice that in the middle of the night, I would be back (hopefully not stepping on anyone) to test youngest and oldest daughter’s blood sugar. My oldest daughter just nodded her head. The room was unusually quiet and a few of the girls sitting closer reached over for hugs. The conversation jarred me a little. I was all but forgotten in the room and the girls didn’t seem to remember that I was there. I debated a little of wondering if I should say something about type 1diabetes or if I should provide a basic refresher course of what we do and why we do it. The longer I thought it, the more I allowed the moment to pass. A second later and the girls started talking about the Justin Beiber poster taped to the back of oldest daughter’s door, noting a red heart marked that “someone” made around his face. Both daughters emphatically denied writing the mark and the laughter picked back up and the giggles erupted in full force. I finished what I was doing and asked the girls to think about getting some sleep before 1:00 a.m. but knowing full well that my attempt was futile. They solemnly nodded and then as I left, the room filled with giggles, whispers and secrets being shared. Maybe I should have explained a little more or maybe it was fine to leave the conversation where it was. Regardless, having type 1 diabetes doesn’t change how this group of girls perceives their friendship with oldest (and youngest) daughter. If anything, it just makes them admire her a little bit more. Oh, and for the middle of the night check… The friend who was most worried about oldest daughter, sat straight up in bed as I came into the room to test the girls. Ironically, when I mentioned it the next day, she didn’t remember a single thing from that moment. Unexpectedly, I took a few days off from blogging. It started with a few skimpier than normal posts while we had snow days and then, continued as my kids recovered from a surprise cold virus. By the end of the week and after another snow day, we dove headlong into Valentine's Day with class parties for each of the girls and then, a slumber party at our home. Finally, the kids and I enjoyed an extra long weekend for winter break. The end result was me dumping everything (sorry, T1D Peeps!) to be with my family. Nothing in this world makes me happier than having these types of precious moments and I feel so lucky to be able to have this magical time. Although now that I look at our train wreck of a house, I wonder if the second most happiest thing is a cleaning crew???? Certainly, I could use one! As my time away from the blogosphere happened, life quietly continued on in the world of type 1 diabetes. 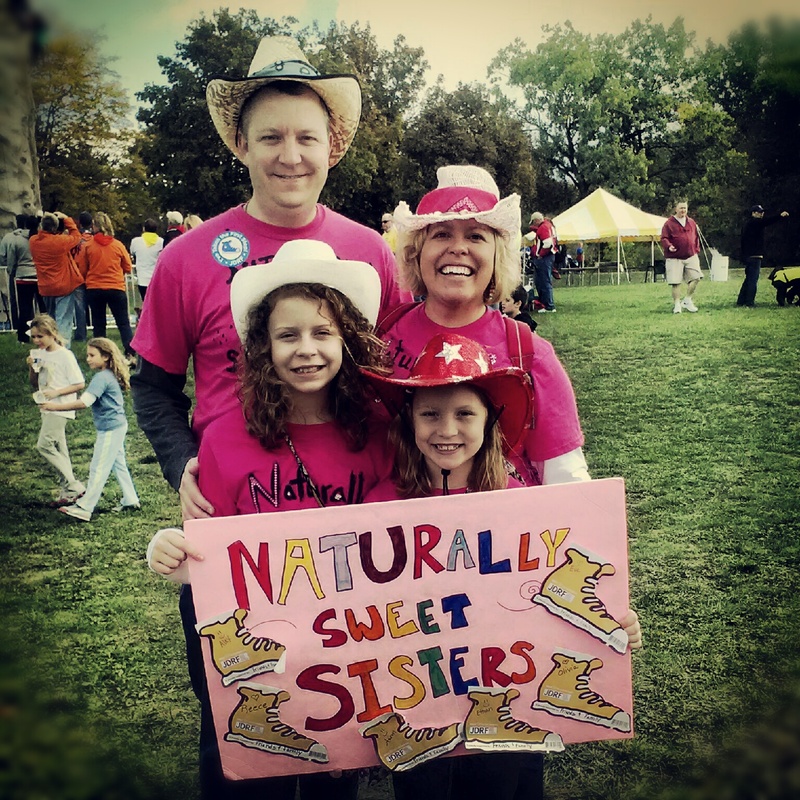 Two separate families learned of their children becoming diagnosed with type 1 diabetes. Another family bravely fought and conquered a school that wasn't allowing their child to be cared for under the ADA 504 plan. One family had enough and headed off to Disney World. The same family dealing with 504 issues started their child on an insulin pump. Two other families headed off to their endocrinologist for their quarterly appointments. One had a great report and the other recovered and vowed to do better next time. And then, most happily, one mom gave birth on Valentine's Day to a brand new baby girl. Life continued on. Some good, some bad and almost everything in between. Well, a week away from blogging was only just that. There were infusion sets to try (and fail), there were CGMs to be ripped out (and replaced), there were snacks to be bolused for (and some forgotten) and there were many, many, many blood glucose checks. A week away from the Internet wasn't really a week away from diabetes in general. It was just some time to spend with the family and enjoy everything lovely and wonderful about kids growing up. And as always, with type 1 diabetes. But even with type 1 diabetes lurking and demanding attention, there was plenty of time for sleep-ins, slumber parties, pizza and popcorn, silly movies, board games, shopping and outdoors play. Memories were made and fun was had by all. And that was exactly what we needed - especially with type 1 diabetes. Since youngest daughter has been pumping insulin for over six years, for the first time ever, her arms were starting to look a little worse for the wear. 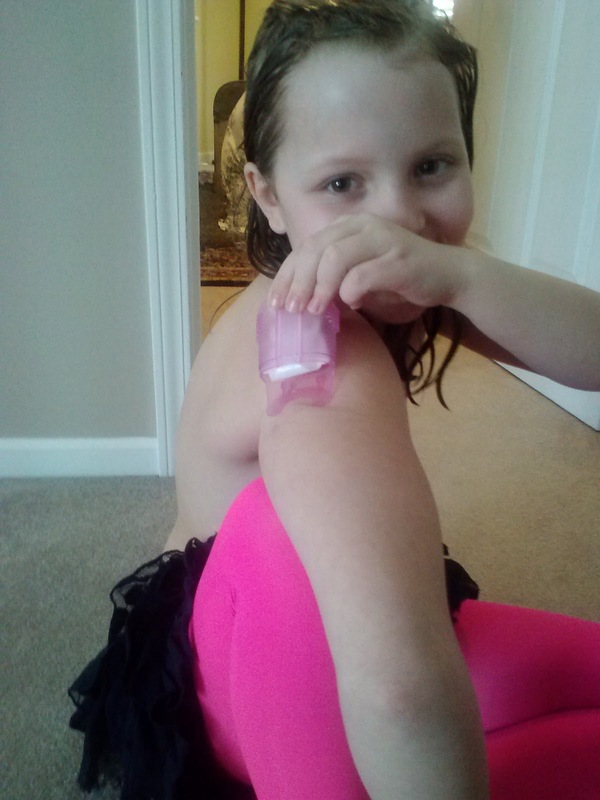 My older daughter, newer at just three years of insulin pumping also had a few distinguishing marks on her stomach that refused to disappear. Not to mention the site marks from CGMs. The girls are getting double the potential for scars. Neither one were particularly worried about them as they didn't cause pain or too much trouble. I did start to worry though. As I noticed how my beloved Vaseline wasn't able to erase the marks, I quietly filed the mental question of what would work until I had a chance to ask my fellow DOC'ers. Thankfully, the DOC knows everything about T1d and has not led me astray yet. But you might wonder at why I was worried when clearly my own two daughters were not. As a mom of daughters, I fretted over the day where body image might become an issue to either one of my children (and maybe, hopefully, it NEVER will). While I stress only positives of their uniqueness in beauty, I am aware that many kids (and adults) are self-deprecating by nature. My best friend that I love and adore often laments over a non-existent weight gain and is unquestionably beautiful - but still to do this day doesn't fully believe that fact!) Even without diabetes and me as their mother, would one day, quite possibly worry over their self-image. What is hardest about that potential situation is that even though I do my best not to let type 1 diabetes rule the roost, I can't entirely avoid all of the damage that constant needle injections do to their skin. My fear that I have shared before, is what happens on the day they want to wear a beautiful prom gown or a wedding dress and worry about showing their upper arms and detracting from the overall beauty of their special day? As irrational as this is, I do not want type 1 diabetes to overshadow any part of their happiness and so, I am very careful with setting up the boundaries needed to keep their bodies as healthy as possible. It is my job as their mom until they are fully ready to take over. Really, this is with diabetes or not. So after much though, I stumbled across one of the Facebook T1d support groups and a post from a woman who is also living with t1d. She recommended Arniflora - Arnica Gel. This natural, homeopathic gel is semi-clear and goes on thinly as a topical to healed site marks. Once on, it miraculously erases the mark and leaves only healthy, bright and clear skin. Thanks to Pat W.! This is my hand and it looks like I should use some too! Wow. This stuffs works. After a week, almost all of the marks are gone and the few remaining look much less visible. Their skin is softer and more smooth too. You can order it here on Amazon. Now, I am not a doctor, nor do I play one on TV. I can only speak for myself and our experience. As with anything, you should ask your very real life medical doctor BEFORE trying this to see if it is right for you. And if you do, I would love it if you came back on here to share your results. Or if you have a magic eraser for healed site marks and want to share that, please post it as well. This is the part of the DOC that is most helpful. 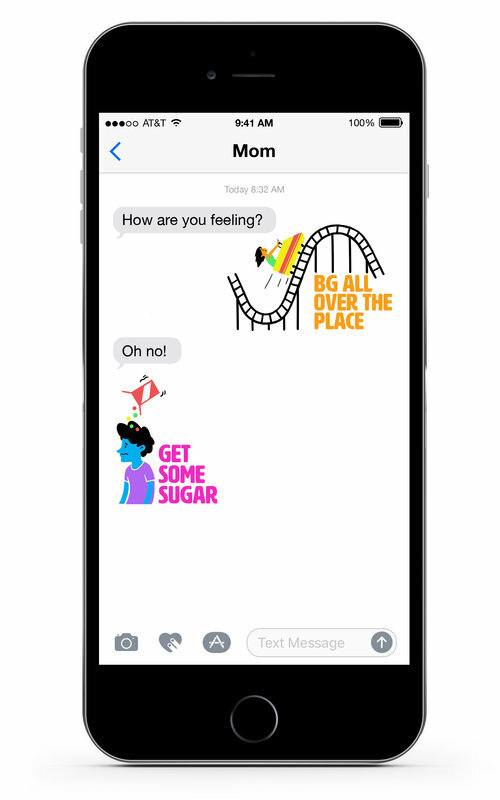 The sharing of information from family to family -- after all, it does take a T1d village! 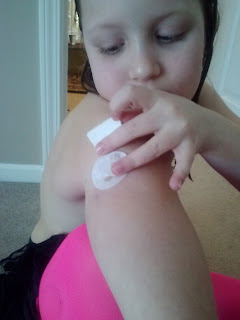 After our very exciting first "kid" infusion set insertion, there was a lot of talk around the Naturally Sweet Sisters household of how the second insertion would go. Mostly to summarize, it was a whole lot of bravado from the kids and a whole lot of 'can-do' cheer leading from the parents. I thought for certain the second insertion would be no big deal for the kids. The second insertion was anything but easy. Youngest daughter decided to go first and she laid out her supplies, filled the cannula and was rewinding/loading/priming her pump, I noticed that her bravado was faltering. "I CAN" slowly became "I don't want to". A few minutes more and my nine-year dissolved into a puddle of tears and said, "Mama, I don't want to do this. Can't you just do it? I am too scared." Now, I am not the kind of mom to force my kids to stab themselves with a sharp spring loaded needle. So I did what any other parent, that feels the same way, would do. "Oh Bunny. I understand. We'll try again next time." And then, with a little extra whimpering from youngest daughter, I made the "CLICK", finished priming her cannula, gave her a big squeeze and sent her happily (and certainly relieved that mom did it for her) on her way. Now, this is where things are not so great with having two daughters that are both diagnosed with type 1 diabetes. When there is a little competition between the two and it results into both reaching towards positive goals, things go wonderfully. However, when one is the witness to another one's absolute freaking-outisms (I am making that a new word today), then things tend to go south rather quickly. I understand that line of thinking. I always equate it to watching someone who is terrified walk out of the roller coaster line. Um, yeah, that would ME! And then watching 10 more people decide not to go because obviously that first person knew that it was terrible! Sorry, roller coaster people, I just get scared and can't help myself. But oldest daughter is two years older. And when I think about that all by itself, I realize that if I am overly gentle, she may decide that it is too scary to perform another site change. So I tell her this. And then, I make up a lame story about riding a horse, falling off and having to get back on. She listens and as she is a good kid, she smiles a little and nods her head in understanding a few times. Somehow, as I tell her the story, the rider has type 1 diabetes and has to give himself a shot before he can get back on. Brothers Grimm having nothing on my story tales. Then, I hand her an IVPrep Wipe and a loaded Inset 30 and tell her where I think is a good location - the opposite side of her belly. At first, I think the story worked its magic and she is ready to do the insertion but I realize that she is just holding the site there for too long a time. Just as I am noticing that she has moved her fingers, she screams to release her fear and pushes "CLICK"... except the site does not go where it is supposed to, instead it skims her stomach and stabs her index finger. She quickly removes the needle and I grab a tissue to stop the blood flow. Oldest daughter is sobbing at this point and I think I have completely lost her. Really, what child is going to EVER want to try another infusion set insertion????? After a few more minutes, she has calmed and even manages a little giggle about poking her finger. I seize the moment and slowly start to unwrap another Inset 30. She is watching me and the debate is clearly written on her face: try one more time or give up? Without saying anything, I hand her the loaded the Inset 30 and I gently swab her belly again. Quietly, she holds the feet to her belly and then, "CLICK" and it is in. Her tears start flowing at this point and I am instantly worried over wondering if the site went in correctly. Is she in pain? Did the needle nick a nerve? I start asking her a barrage of questions but as I am, I can see that she is smiling and laughing through the tears. She hugs me hard and tells me that she is so relieved that she did it. "Two times in a row, Mom. Actually, three time!s," she says laughing and pointing to her finger. A few more hugs and then she runs to find her sister to share the victory of inserting a second infusion set. And I sit there, surrounded by hard plastic containers, needles, wrappers and bloody tissues. I am shell-shocked. Sad. Happy. Amazed. Horrified. Relieved. All of these emotions cause a few hot tears of my own. Most of all, I can't decide if this was a victory against the Diabetes Monster or a win for the terrible nature of all our kids go through while living with type 1 diabetes. With one last sigh, I think about having to do this all over again in 2 more days. That means that my kids are about halfway through 180 days of packed lunches. At this point, since my kids do not purchase lunch at school, something new and exciting is the only way to beat the typical home-made lunch "blahs". I thought you might be feeling the same way and this would be a good time to share a new way to spice up the typical lunch without adding in extra carbohydrates. Here is a new Water Enhancer from Market Pantry at Target. For around $2.99, and in a variety of flavors, your child can add a squirt or two to any bottled water for a fruit flavored taste. Bonus: No impact on blood sugar levels, either! I do keep each of the girls' water flavors safely stowed in a ziplock baggie in case of an explosion. So far, so good and nothing has leaked or spilled anywhere. Also, the first bottle that they chose lasted around 60 days (or about two and half months of lunches). They seem to love having something special like this in their lunch box and it has allowed me to reduce my grocery bill by no longer buying carb-free or low-carb juice boxes or pre-packaged flavored waters. According to my 6th grader, "this product is much cooler" anyway. And in case you are wondering, no one from Target or Market Pantry asked me to say anything about their products or offered me any compensation to do so. 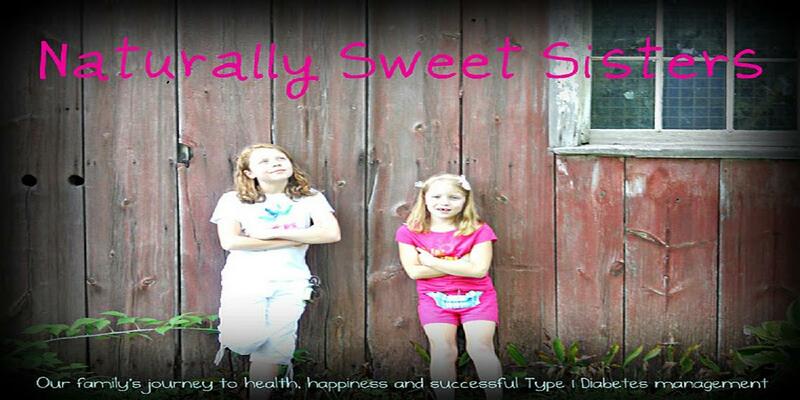 I am just a big fan of this helpful type 1 diabetes tip from Naturally Sweet Sisters and wanted to share it with you! When I say that word, both of my daughters ears instantly perk up. It has all of the magic of 'Parent Trap' contained within that one syllable. They both LOVE the camp experience; from when they were just little five-year old tike's at day camp until recent years, where they stayed overnight with the so-called "big kids"! I still love this version best. Camp is everything that it should be. Meaning, muddy, silly, song-singing, smore-making, deep conversations, cute boy finding, best friend seeing, flashlight animal teasing, FUN! And best of all, camp is for all kinds of kids; big and small.... this one being exclusively for kids living type 1 diabetes. Although my kids love this one just as much! ﻿ Also, it is a little bit of a break from type 1 diabetes. For us as parents and for our kids too. We all need to re-charge our batteries and this one little week is the perfect way to make that happen. Now, if that hasn't convinced you to get a little of that 'Parent Trap' enthusiasm, than maybe reading a few of my older posts on camp will. Good luck with your decision and please, feel free to facebook us at Naturally Sweet Sisters or leave a comment below with any questions on camp. As five-year veterans, we can help you through a successful camp experience too!